Unless you are Autistic or have some other exceptionality, you likely have generalized senses. This means that you can focus your eyes on what you need to look at. You can look at the teacher talking, the details or the big general picture. You can hear a specific sound, but are able to filter sounds out well enough to hear the person talking to you and block out the ticking clock. You can sit when you need to sit. You can write what you want to write. You move how you need or want to move. You will jump back if you touch a hot burner and will put on your coat, shoes and socks to go out into the cold. If you don't have generalized senses and instead have a mixture of selective, global, (and perhaps some generalized senses), performing is different for you. You might not feel the cold immediately. You might find a light touch painful, sitting can take all your focus otherwise you may jump up or slump. Looking at eyes or your work can be very taxing. Trying to aim correctly or move correctly may at times feel hopeless. People with generalized sense may prefer to type or write in a certain position, but say someone posted the keyboard to the wall? You could easily adjust or adapt and while you might not like it, could type out whatever you'd like. While you might prefer to draw or write with a certain pencil, or certain size, or with a certain amount of space around you, if someone changes it up, you can still draw or write, even though it is less comfortable. If your senses are not generalized, then a little change may make it impossible to complete the task. It isn't that you suddenly became less intelligent...oh, no! It is not that!...But a held letter board just in the right spot verses on the table may be the different between communicating and aiming as desired and not being able to, in fact it may even seem like you don't register what a letter is (although you know perfectly well all your letters.) When the letterboard, drawing page, etc is held up where it is most comfortable for you to coordinate your senses, all the sensory struggles are lessened. But a little change like placing it on the table, or having the drawing page too high, may make it difficult to communicate your thoughts or draw. 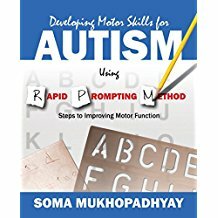 Where you are most comfortable pointing to letters, drawing or typing, etc, is called your performance field, as expressed by Soma Mukhopadhyay in her booklet "Learning Life Skills Using Rapid Prompting Method-Part 1." With time, the performance field can be expanded or generalized to other places like learning to type or draw intentionally directly on the table. Many people struggle to understand this concept...understandably. The following is to help, anyone who wants to understand this better. I hope parents, teachers, students will benefit. ​Thanks to James and his mother, Liz, (who filmed) for making this possible. At the bottom of the document is the video. I am explaining with pictures what you will see to make the rational more clear of what I was doing and why. The video shows the order I did each step. We did it at the end of a work day after all the sessions. So, while he agreed to it and did a great job, but a little tired and hesitant at moments. I held a clip board with a blank piece of paper on it in his performance field. I folded the piece of paper in half. On the top side I hand over hand motor modeled how to draw each part of the dog. When you open it I would have him draw the step independently. I would, for example, hand over hand draw the circle for the eye. Then open the paper and he would independently draw the circle of the eye. Then we closed it and we would hand over hand motor model draw say the ear. Then open it up and he would draw it. Firgure A shows the dog we drew hand over hand, step-by-step. Figure B shows his independent drawing of the dog where he drew each part after a motor model. In this picture, he draws his dog by himself after we finished it step by step. I just held up the board in performance field and he drew. I sometimes verbally told him to draw some more, but there was no motor modeling. In performance field he can draw and add some of his own unique style. Next, I had him draw on the table. He hesitated so I draw the dog again in front of him (figure C). Figure D, is his drawing on the table with the model removed. As you can see, even with the instruction were he has already drawing the dog two times (one step-by-step, and the second independently) and he had seen it drawn by me two times (once, with me drawing step-by-step (figure A) and once after he had drawn one independently (figure C) ), he struggled to draw outside of his performance field. After that, I motor modeled step by step how to draw the dog (Figure E), only this time I did it on the table/outside the performance field. You can see (Figure F), that performance field matters. 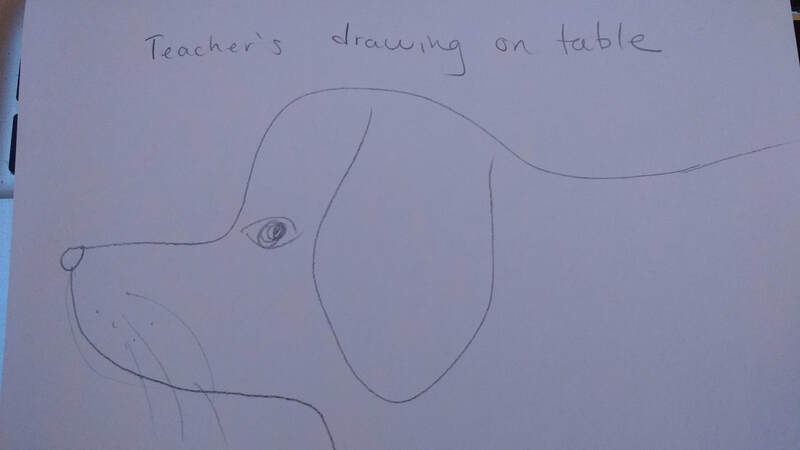 He is not yet able to draw independently on the table a recognizable dog. He formed some of the shapes correctly. He has the motor skills to move and draw. But when drawing/performing outside the performance field the pathway of intention or control is not there...(yet). To get James to generalize his performance field to the table I would want him to get very comfortable drawing in the performance field. Once he is motor, sensory and emotionally ready, I would then start to lower the held up clip board and have him draw at a little less comfortable range. I could also do more of motor modeling on the table and then have him draw each part independently. I would do both of these things (lower the drawing surfaces closer and closer to the table AND motor modeling directly on the table) until the table becomes a comfortable place to draw on and he can draw with control. Each student is different. Therefore, exactly how it will look for each is different. Performance Field is a real thing. Students without generalized senses in all areas, are not able to immediately perform at their cognitive level anywhere. For a student to be successful, task should be held up/placed in their performance field. Then with time that performance field can be expanded and generalized. How to teach a number of life skills. 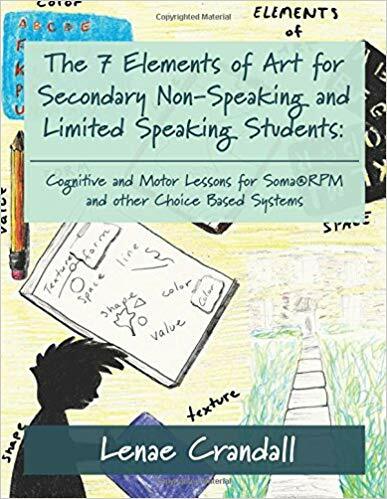 RPM art lesson plans that include cognitive and motor lessons. 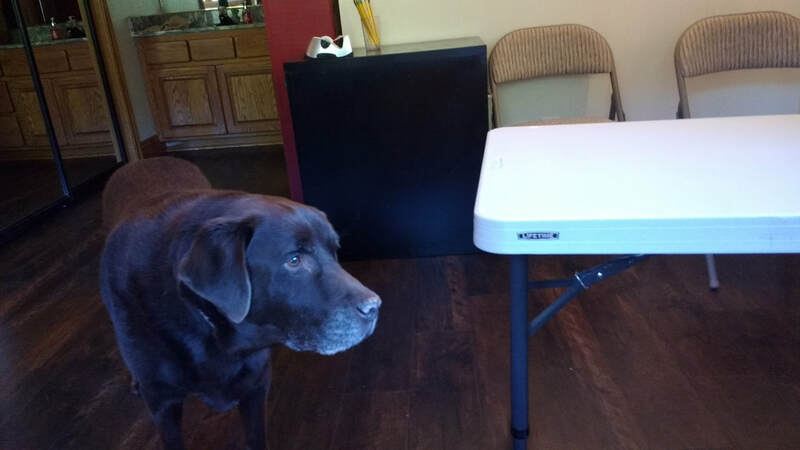 The dog drawn in this post is found in here as well. More instruction on building skills beyond the letter board being held.